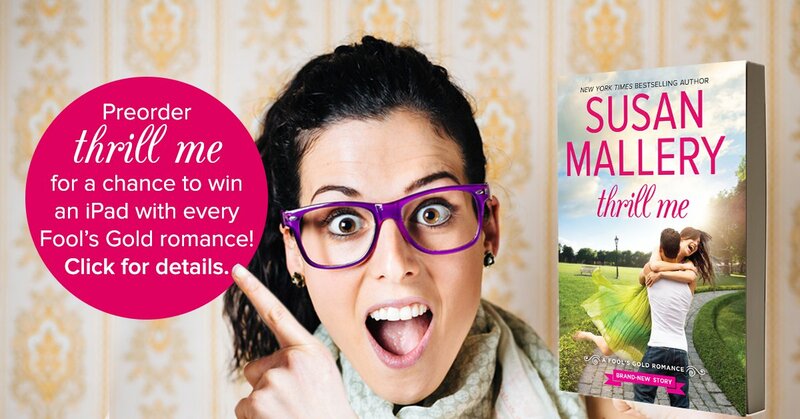 Celebrate the upcoming release of The Summer of Sunshine and Margot with a chance to win an amazing prize! 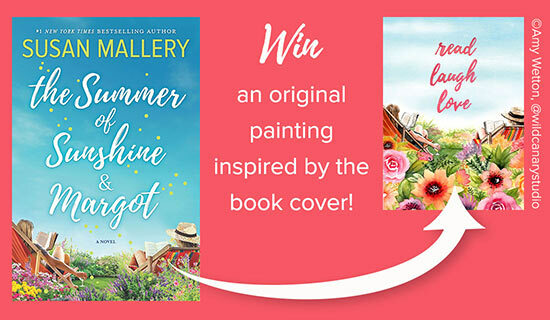 Preorder The Summer of Sunshine and Margot to Win A Painting Signed by Susan Mallery! Susan is the keynote speaker at the Utah Readers' Luncheon. 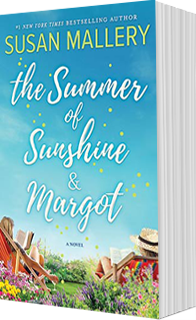 The Summer of Sunshine and Margot is available today! The Best of Friends (reissue) is available today in mass market paperback! 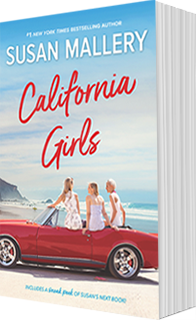 California Girls is available today! Secrets of the Tulip Sisters (reissue) is available today in mass market paperback! It Started One Christmas is available today! This ebook novella is a follow-up to When We Found Home but can be read as a standalone. Not Quite Over You is one of the Best Romances of 2018, as selected by the editors at Amazon.com! Not Quite Over You is a bestseller! #4 on the New York Times bestsellers list for combined print and ebook fiction, and #10 on the USA TODAY list, which tracks all types and formats of books on a single list. NOT QUITE OVER YOU (Happily Inc) release day! NOT QUITE OVER YOU is available in mass market paperback, ebook, and audiobook. Why Not Tonight is a bestseller! WHY NOT TONIGHT (Happily Inc) release day! WHY NOT TONIGHT is available in mass market paperback, ebook, and audiobook. Buy a signed copy of When We Found Home from a participating independent bookstore, get a stunning Alex and Ani bracelet free! WHEN WE FOUND HOME (standalone) is available today in hardcover, ebook, and audiobook! Susan will be happy to sign any books purchased in the store. Out of respect for the bookseller, we ask readers not to bring books from home. In its second week of release, Sisters Like Us is #71 on the USA Today bestsellers list! Sisters Like Us has debuted on the New York Times bestsellers list for combined print and ebook sales at #13, and at #18 on the USA Today bestsellers list, which tracks every format and genre of book on a single list. SISTERS LIKE US (Mischief Bay) is available now in paperback, ebook, and audio! Read chapter 1 at MischiefBay.com. A MILLION LITTLE THINGS (Mischief Bay) is available now in mass market paperback! This book originally came out in trade paperback earlier in 2017. It's also available in ebook and audiobook. 8 pm/7 c: World premiere of Marry Me at Christmas (Fool's Gold) on Hallmark Channel USA! Join the watch party at Twitter.com/SusanMallery and Facebook.com/SusanMallery. Susan will give away 30 books and other prizes during the show. Use the hashtag #MarryMeAtChristmas. SECOND CHANCE GIRL has debuted at #6 on the New York Times bestsellers list for combined print and ebook fiction, and at #8 on the USA Today bestsellers list, which tracks all books on a single list! Happily Inc Girlfriend Getaway - September 30, 2017, 10 am - 4 pm at the Hilton Fort Worth in Fort Worth, TX - Details at Happily Inc Girlfriend Getaway. SECOND CHANCE GIRL is available today in mass market paperback, ebook, and audiobook! Learn more at HappilyInc.com. Hallmark has announced that Marry Me at Christmas (Fool's Gold) will premiere on October 28, to kick off their season of brand-new Christmas movies! August 22-September 8 — Happily Inc Blog Tour. Every stop offers a chance to win a $100 bookstore gift card! Amazon.com has named YOU SAY IT FIRST a Best Book of the Month in Romance! You Say It First has debuted at #6 on the New York Times bestsellers list for combined print and ebook fiction! It has also debuted at #10 on the USA Today bestsellers list, which tracks all formats and genres of books on a single list. Thank you, readers, for your enthusiasm for Susan's books! YOU SAY IT FIRST is available today in mass market paperback, ebook, and audiobook! Learn more at HappilyInc.com. Secrets of the Tulip Sisters marks Susan's first time on the New York Times hardcover bestsellers list, debuting at #12! It also hit #15 on the combined print and ebook list with the NYT, and #18 on the USA Today list, which tracks every type of book on a single list. Secrets of the Tulip Sisters is available today in hardcover, ebook, and audiobook! Daughters of the Bride is available today in mass market paperback, ebook, and audiobook! Falling for Gracie (reissue) is available today! The second of three books set in Los Lobos, California. The other two are Someone Like You and Daughters of the Bride. Secrets of the Tulip Sisters Virtual Tour — Read the first four chapters of Susan's next book and enter at each stop for a chance to win a bouquet of tulips delivered to your door! Married in Whitehorn (reissue) is available now in ebook with a brand new cover! The Hallmark Channel announces the cast of MARRY ME AT CHRISTMAS in Entertainment Weekly Magazine! Rachel Skarsten will play bridal boutique owner Madeline Krug, and Trevor Donovan will play movie star Jonny Blaze. Someone Like You (reissue) is available today! The first of three books set in Los Lobos, California. The other two are Falling for Gracie and Daughters of the Bride. A Million Little Things made the bestsellers lists with the New York Times, USA Today, iBooks, and Publishers Weekly! A Million Little Things debuted at #8 on the New York Times bestsellers list for combined print and ebook sales! A MILLION LITTLE THINGS has been named a Best Book of the Month in Romance by the editors at Amazon.com! BEST OF MY LOVE is an RT Reviewers' Choice Nominee in the Best Love & Laughter category! Heartfelt thanks to Kobo Canada for naming DAUGHTERS OF THE BRIDE one of the Best Romances of 2016! Audiofile Magazine named THE GIRL OF HIS DREAMS, narrated by Tanya Eby, as one of the Best Audiobooks of 2016! This is a special honor, since THE GIRL OF HIS DREAMS is a reissue. DAUGHTERS OF THE BRIDE is one of the Best Romances of 2016, according to Library Journal! Congratulations to the other four romance authors on the list: Mary Balogh, Loretta Chase, Christine Feehan, and Sabrina Jeffries! I'm honored to be in your company. And special thanks to all the librarians who nominated me! Marry Me at Christmas hit the bestsellers lists when it came out in mass market paperback, then fell off, and now it has popped back up at #24 on the Publishers Weekly bestsellers list! Readers are getting into the Christmas spirit! Marry Me at Christmas (Fool's Gold) is available today in mass market paperback! It was first issued in gift-sized hardcover in 2015. The paperback reissue includes A Kiss in the Snow, a Fool's Gold novella that is new for 2016. A Kiss in the Snow (a Fool's Gold novella) is available today in ebook! It will be available in print on October 25 as the bonus novella with the paperback reissue of Marry Me at Christmas. For a limited time, BEST OF MY LOVE is $1.99 wherever ebooks are sold! Circle of Friends, a serialization of the Positively Pregnant series, is available today. This is a reissue of three of Susan's category novels: Having Her Boss's Baby, The Ladies' Man, and Her Last First Date. Also, BAREFOOT SEASON and THE GIRL OF HIS DREAMS are also just $1.99 for the Kindle for a limited time. Don't miss out! Daughters of the Bride has debuted at #15 on the Publishers Weekly bestsellers list! Daughters of the Bride is #6 on the Wall Street Journal ebook bestsellers list! Daughters of the Bride is a bestseller! #5 on the NYT ebook bestsellers list, #15 on the combined print & ebook fiction list, and #19 on the USA Today list, which tracks all types and formats of books (fiction, nonfiction, hardcover, paperback, ebook) on a single list. Thank you to all my wonderful readers! DAUGHTERS OF THE BRIDE is available today! Click "read more" (below) to see prizes and the full schedule. Visit me at each of the blogs below for a chance to win one of 21 Daughters of the Bride Survival Kits. Each prize pack consists of a Daughters of the Bride excerpt book with $2 coupon, a Daughters of the Bride bookmark, a Meant to Bee honeypot (you’ll understand that when you read the book), Blushing Bride Essie nail polish in an adorable Daughters of the Bride tutu, a Susan Mallery pen, a Daughters of the Bride Post-It book, a votive candle, and a small organza bag of Jordan almonds and Hershey’s Kisses. BEST OF MY LOVE is a bestseller! The latest Fool's Gold romance debuted at #4 on the New York Times bestsellers lists for mass market paperbacks and for ebooks, and #6 on the NYT combined print and ebook list; #6 on the USA Today bestsellers list, which tracks all book formats on a single list; #4 on the Publishers Weekly bestsellers list; and #4 on the Wall Street Journal fiction ebook bestsellers list. BEST OF MY LOVE is available today! April 12-17, 2016 Susan will attend the RT Convention at the Rio Hotel and Casino in Las Vegas. She'll be at the following events. Come to them all to collect all the different Susan Mallery swag! Plus, Susan will do a popup signing with free books at an unannounced time. Follow the hashtags #RT16 and #RTPOPUP on Twitter or follow the RT Convention Facebook page to find out when the popup signings are happening. You have to move fast because books are limited! THE FRIENDS WE KEEP (Mischief Bay book 2) is available today! EVENING STARS is a New York Times bestseller, moving up to #15 on the mass market paperback list in its second week of release! EVENING STARS (Blackberry Island) is available today in mass market paperback! This Christmas I've gotten together with 8 of my author pals to offer our beloved readers the chance at winning "A Few of Our Favorite Things." Win books & gifts from Debbie Macomber, Mary Kay Andrews, Lisa Jackson, Fern Michaels, Linda Lael Miller, Stephanie Laurens, RaeAnne Thayne, and Jennifer Chiaverini! Enter here: Favorite Things Contest. HEA USA Today exclusively reveals the cover of DAUGHTERS OF THE BRIDE... with the first-ever sneak peek of Susan's biggest book of 2016! Click the link to see the cover and start reading! MARRY ME AT CHRISTMAS is a bestseller! #11 on the NYT ebook list, #16 on the NYT combined ebook and print list, and #20 on the USA Today bestsellers list, which tracks all types of books on a single list (fiction, nonfiction, hardcover, paperback, ebook...). Very exciting placement for this gift-sized hardcover! MARRY ME AT CHRISTMAS (Fool's Gold) is available today! The Fool's Gold Mystery Quilt with Quilter's World Magazine week 2 instructions are posted! Click the link to get the free quilt pattern. Deal alert (UK): For a limited time, BAREFOOT SEASON is free from iBooks in the UK, and the other two Blackberry Island novels are on sale! Thrill Me has hit #7 on the USA Today bestsellers list, which tracks every type of book on a single list - hardcovers, paperbacks, ebooks, fiction and nonfiction - all on one list. Thrill Me is a #1 New York Times bestseller! This is the first time that one of Susan's books hit number one on this prestigious list. Fool's Gold Getaway - Westin North, Chicago. Tickets required: Fool's Gold Getaway. THRILL ME, a Fool's Gold romance, is available today! First time in print! Kiss Me has debuted at #2 on the New York Times bestsellers list for mass market paperbacks, #8 on the ebooks list, and #11 on the combined paperback and ebook fiction list. The book also debuted at #9 on the USA Today bestsellers list, which tracks all books on a single list (fiction, nonfiction, paperback, ebook, etc). You can read the first FOUR CHAPTERS of Thrill Me for free in my blog excerpt tour! KISS ME, a Fool's Gold romance, is available today! First time in print! Register your pre-order of THRILL ME here for a chance to win one of four amazing weekly prizes, including an iPad loaded with all the Fool's Gold books! Deal alert! ‪‎iBooks‬ has put six of the Fool's Gold ‪#‎books‬ on sale for $3.99 or less. Limited time offer, so don't wait. Enter the Fool's Gold Challenge scavenger hunt, win a book charm necklace! HOLD ME has debuted on the New York Times bestsellers list at #2! On May 2 and 3, Susan will attend the Love Letter Convention in Berlin, Germany. Find out all the details at LoveLetterConvention.com! HOLD ME, a Fool's Gold romance, is available today! First time in print! This meet-and-mingle plus luncheon will feature a brief talk from Susan, plus a book signing, in a more intimate setting than at the Southwest Florida Reading Festival. Tickets must be purchased by March 16. Click here for reservation form. Contact the Friends of the Library at www.FriendsofSCRL.org. Susan will be signing at the Southwest Florida Reading Festival, Harborside Event Center & Centennial Park, Fort Myers River District. Click the link for details! March 1-31: The Romance Reviews anniversary party with giveaways. THE GIRLS OF MISCHIEF BAY is available today! First time in print, first book of a brand new series! New Year, New Author contest! Win books by 25 authors. Enter on the Contest page! ALL FOR YOU (an anthology) is available today! This is the first time that HALFWAY THERE, a Fool's Gold novella, is available in print. Also available today is SHELTER IN A SOLDIER'S ARMS, a reissue of a Susan Mallery classic love story! Deal alert! Barnes & Noble﻿ is offering a *great* price on CHRISTMAS ON 4TH STREET for the #NOOK - just $1.99. Black Friday sale on EVENING STARS, all major ebook retailers, just $3.99! Three days only. BAREFOOT SEASON is available today in mass market paperback and ebook! This is the first book of the Blackberry Island series, originally published in trade paperback. BEFORE WE KISS has been named a 2014 Best Books-Romance by the editors at Amazon.com! Deal alert! For a limited time, Google Play is offering WHEN WE MET for only $2.99! CHRISTMAS ON 4TH STREET and YOURS FOR CHRISTMAS are available today! This is a mass market paperback reissue of CHRISTMAS ON 4TH STREET, in which YOURS FOR CHRISTMAS is a bonus novella. YOURS FOR CHRISTMAS is also available indivually as an ebook novella. 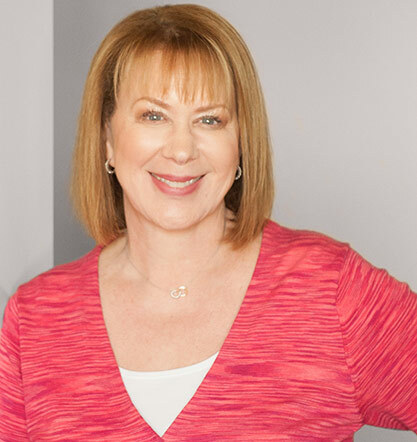 Susan Mallery will be the Keynote speaker at the New Jersey Romance Writers conference at the Renaissance Woodbridge Hotel, Iselin, New Jersey. A CHRISTMAS WEDDING RING is available today! This is a reissue of reader favorite A WEDDING RING PROMISE. World debut of the Mischief Bay website! EVENING STARS (paperback) is on sale at Amazon.com for about half-off! One day only: WHEN WE MET is $1.99 from iBooks. 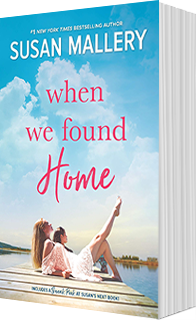 WHEN WE MET is today's Kindle Daily Deal! $1.99, today only. UNTIL WE TOUCH has debuted at #4 on the New York Times bestsellers list for mass market paperbacks and #6 on the USA Today list, which tracks all types and formats of books on a single list! UNTIL WE TOUCH, a Fool's Gold romance, is available today in paperback and ebook! BEFORE WE KISS has debuted on the New York Times mass market paperback bestsellers list at #5, on the ebook list at #6, and on the combined print and ebook list at #8! BEFORE WE KISS, a Fool's Gold romance, is available today in paperback and ebook! UNTIL WE TOUCH has been named one of the Summer's Biggest Books by iBooks! May 14-18, Susan will attend the Romantic Times Convention in New Orleans. WHEN WE MET has debuted on three New York Times bestsellers lists - #3 in mass market paperback, #5 in ebooks, and #6 on the combined print and ebook list. It has also landed at #10 on the USA Today bestsellers list, which tracks fiction, nonfiction, print and ebook all on a single list. Chasing Perfect is iBooks' the Book of the Week. It's free this week only in the US, Canada, and the UK! WHEN WE MET, a Fool's Gold romance, is available today in paperback and ebook! Susan is the Featured Author at Books-a-Million! Click for 30% off Susan Mallery's books. 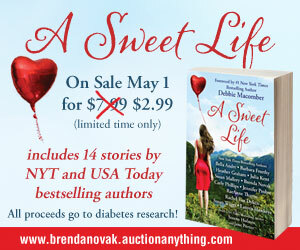 A SWEET LIFE boxed set is available for pre-order for only $2.99! All proceeds benefit diabetes research. EVENING STARS is a New York Times bestselling book! It debuted at #13 on the trade paperback list, #17 on the ebook list, and #19 on the combined print and ebook list! 4 pm PST/ 1 pm EST: Chat live with Susan at Facebook.com/SusanMallery! Win prizes! EVENING STARS, the final book in the Blackberry Island trilogy, is available today! BAREFOOT SEASON is being featured as a Kindle Select 25! PRODIGAL SON (a reissue) is available today! Three Little Words has been selected for iBooks Best of 2013! Visit the contest page every day from December 1-12. Every day for 11 days, Susan will give away one set of Fool's Gold coffee mugs, and on the 12th day, someone will win a beautiful red leather portfolio. DREAM WEDDING, a 2-for-1 reissue of Dream Bride and Dream Groom, is available today! THREE LITTLE WORDS has been named by Amazon.com as one of the Best Books of 2013 in the romance category! A FOOL'S GOLD CHRISTMAS mass market paperback reissue release day! CHRISTMAS ON 4TH STREET debuted on the New York Times bestsellers list for hardcovers at #24 and on the list for ebooks at #10! Also, CHRISTMAS ON 4TH STREET landed at #15 on the USA Today bestsellers list! For 3 days only: get 50% off THREE LITTLE WORDS and TWO OF A KIND for your Nook! CHRISTMAS ON 4TH STREET release day! CHRISTMAS ON 4TH STREET named a Best Book of the Month by Amazon.com! 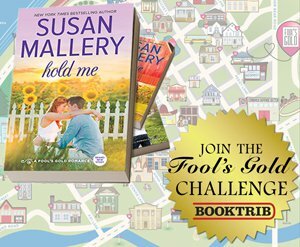 Release Day: Susan Mallery's FOOL'S GOLD COOKBOOK with exclusive Fool's Gold novella! THREE LITTLE WORDS is named a "Best Book of the Month" in romance by the editors at Amazon.com! This is the third Susan Mallery book to receive this honor so far in 2013. In its second week of release, THREE LITTLE WORDS is a #10 NYT bestseller! THREE LITTLE WORDS has debuted at #2 on the New York Times bestsellers list, tied for #1! It's also #4 on the USA Today bestsellers list, which tracks all books on a single list. THREE LITTLE WORDS (Fool's Gold book 12) release day! Ford Hendrix leaves the Navy SEALs and returns to his hometown! In its fourth week of release, TWO OF A KIND is at #21 on the New York Times bestsellers list! RWA Literacy Autographing - Atlanta Marriott Marquis - 5:30-7:30 pm. Susan will sign copies of JUST ONE KISS (Fool's Gold book 10). In its third week of release, TWO OF A KIND is at #20 on the New York Times bestsellers list! TWO OF A KIND is named one of the Best Books of the Month by editors at Amazon.com! TWO OF A KIND is #7 on the USA Today bestsellers list, a list that tracks all books on a single list - hardcover, paperback, ebook, fiction and nonfiction! TWO OF A KIND hit #8 on the New York Times bestsellers list for mass market paperbacks and #9 on the list for bestselling ebooks! TWO OF A KIND is on sale for $3.99 for the Kindle and the Nook! Get it now, we don't know how long the sale will last! TWO OF A KIND (Fool's Gold book 11) release day! JUST ONE KISS landed at #9 on the NYT bestsellers list for mass market paperbacks and is also an ebook bestseller! JUST ONE KISS featured by Barnes & Noble on Eloisa James's June Romance Review. Book Expo America. Susan's events: 5/30, 11:30 am-12:30 pm, signing JUST ONE KISS, booth 1238. 5/31: 2 pm-3 pm, chute signing THREE SISTERS. 6/1, 10 am-11:30 am, booth 1238. JUST ONE KISS (Fool's Gold book 10) release day! CHASING PERFECT is today's Nook Daily Find. Get it for $1.99! HALFWAY THERE (a Fool's Gold ebook novella) release day! April 12-13: Susan has been invited to speak on a women's fiction panel at the L.A. Times' Festival of Books. In its third week of release, Three Sisters is #5 on the USA Today bestsellers list and #3 on the New York Times ebook bestsellers list! 12 Susan Mallery books on Publishers Weekly's Bestselling E-books of 2012! THREE SISTERS is a bestseller! #16 on the New York Times trade paperback list, #19 on the NYT ebook list, #20 on the NYT combined ebook and paperback list, and #19 on the USA Today bestsellers list! THREE SISTERS (Blackberry Island book 2) release day! Three Sisters has been named a "Best Book of the Month" by the Amazon Editors! THREE SISTERS is named one of the Top 13 New Books for 2013 by the editors at Bookspan! QUINN'S WOMAN, a reissue from Susan's popular Hometown Heartbreakers series, hit the NYT bestsellers list at #25! The iBookstore has named BAREFOOT SEASON one of the Top 10 Romances of 2012! A FOOL'S GOLD CHRISTMAS was chosen as a Fresh Pick by readers at FreshFiction.com. Thank you!! Ashley J. of Freedom, WI won a NOOK! Madison E., an international reader, won a $100 Amazon gift card! Terri S. of Green Valley, AZ won three books from each author, for a total of NINE BOOKS!!!!!! A CHRISTMAS BRIDE has hit #5 on the New York Times mass market paperback list! A FOOL'S GOLD CHRISTMAS is a New York Times bestseller! In its first week of release, it's at #11 on the ebook bestsellers list and at #18 on the hardcover bestsellers list! Thank you to all my wonderful readers!!! Kirkus Reviews has named A FOOL'S GOLD CHRISTMAS one of the Most Anticipated Books of Fall 2012! A FOOL'S GOLD CHRISTMAS will be released on September 25 and is available for pre-order now. In its third week of release, ALL SUMMER LONG is at #15 on the New York Times bestsellers list! In its second week of release, ALL SUMMER LONG is at #12 on the New York Times bestsellers list! ALL SUMMER LONG is at #11 on the USA Today bestsellers list, which tracks all books on a single list - fiction, nonfiction, hardcover, paperback, and ebook! ALL SUMMER LONG has hit the New York Times bestsellers list at #4! In its second week of release, SUMMER NIGHTS is #13 on the NYT and #24 on the USA Today bestsellers lists! Thank you, readers! SUMMER NIGHTS has landed on the USA Today bestsellers list at #12! This is a list that tracks all formats and types of books on a single list, and #12 is a fabulous accomplishment. SUMMER NIGHTS has hit #2 on the New York Times bestsellers list, a new all-time high! In its second week of release, SUMMER DAYS is at #15 on the New York Times bestsellers list! SUMMER DAYS has landed at #5 on the New York Times bestsellers list, thanks to the enthusiastic readers who rushed out to buy the book during its first week of release! And SUMMER DAYS is #11 on the USA Today bestsellers list, which tracks all books on one list - hardcover, paperback, ebook, fiction, and nonfiction, all on one list. ONLY US: A FOOL'S GOLD HOLIDAY is #7 on the New York Times ebook bestseller list! If you don't have an ereader, you can download free software for the Kindle or the NOOK that allows you to read ebooks on your computer. ONLY YOURS has been nominated for a 2011 RT Reviewers' Choice Best Book Award! The USA TODAY bestsellers list tracks all books - fiction, nonfiction, hardcover, paperback, ebook, so it was a real thrill for Susan to learn that ONLY HIS debuted on the USA TODAY list at #8, another personal best for her. Her previous best was to reach #17, which she did with both ONLY YOURS and FINDING PERFECT. ONLY HIS has hit #3 on the New York Times bestsellers list, a personal best for Susan! Thrilling news! Booklist has named ONLY MINE as one of the Top 10 Romances of 2011. That means that my books have been named to this prestigious list four of the past five years! This is such an honor! Thank you to all of you who rushed out to buy ONLY YOURS during its first week of release. I just learned that it has hit #7 on the New York Times bestsellers list for mass market paperbacks and #17 on the USA TODAY list, which tracks every type of book on one list.